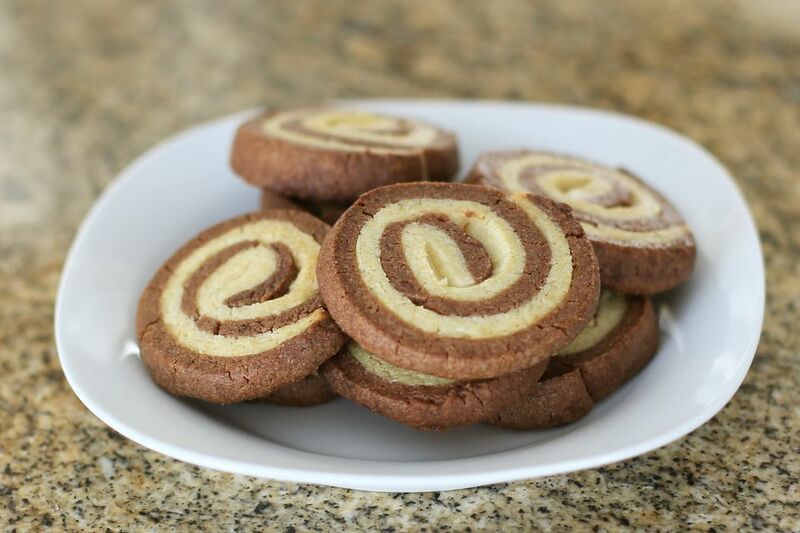 These pinwheel icebox cookies are made with chocolate and vanilla doughs. The cookies should chill for at least 4 hours, so plan to start them early in the day or a day in advance. The cookies are perfect for Christmas, and though they have a few extra steps, they are well worth the effort. Or, try the chocolate nut cookie variation below. These are excellent cookies to bake for the holidays and special occasions. In large mixing bowl cream the butter and sugar together until light and fluffy; add egg and vanilla; blend well. Combine the flour and salt in a bowl or on a sheet of wax paper. By hand or with a mixer on low speed, gradually add the flour mixture to the creamed mixture; mix just until combined. Divide the dough into 2 equal portions; blend the cocoa into one portion. Refrigerate the two portions for at least 1 hour. On a lightly floured surface, roll the plain vanilla dough into a rectangle about 16-by-6 inches. Roll the chocolate dough out to a rectangle the same size and carefully place on top of the plain dough. Roll the layered doughs out to a thickness of about 1/4 inch. Beginning at the wide side, roll the dough up tightly. Wrap in plastic wrap and refrigerate for 4 to 6 hours or overnight. Cut the roll into 1/8-inch slices. Let the dough warm slightly if it breaks up when cutting. Arrange the cookies on ungreased or parchment lined baking sheets about 1 inch apart. Bake for about 7 to 9 minutes, or until the cookies are set. Remove the cookies from the baking sheets immediately and cool completely on racks. Variation: To make chocolate-nut cookies, mix all of the dough with 1/2 cup of cocoa. Put 1 1/2 cups of finely chopped walnuts or pecans in a large plate. Divide the dough into two portions and shape each portion into a cylinder about 1 1/2-inches in diameter. Roll each cylinder in the finely chopped nuts. Wrap in plastic wrap and refrigerate as for the chocolate pinwheel cookies. Slice and bake as directed above.